See scan - very good condition. This is a nice and rare antique 18th century Ottoman Turkey / Turkish Empire silver repousse tobacco box or snuff box with floral design. 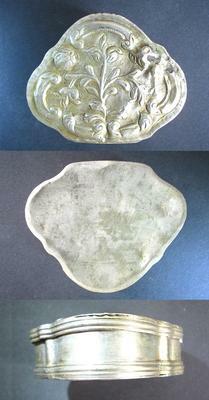 The lid of the box is finely crafted with a high relief repousse foliate / flower scene. The bottom base of the tobacco / snuff box is plain. The box measures 62mm x 50mm x 20mm and weighs approximately 36.7 grams of silver. A tiny section of the lid appears to have been repaired in the past by the owner gimself, but the repair is finely done obviously by a master silversmith and is nearly invisible. Absolutely nice and rare antique Ottoman Turkish silver and antique jewellery / object de vertu collector piece and one of the rare Georgian era silver tobacco boxes and snuff boxes.